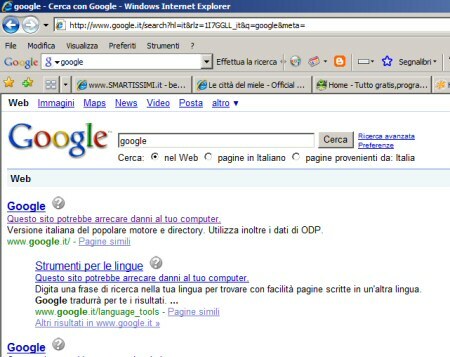 Google: il web è tutto un pericolo! Oggi deve essere successo qualcosa nei google labs. Qualsiasi ricerca effettuata sul motore di ricerca riporta – per ogni risultato – l’informativa sulla pericolosità. 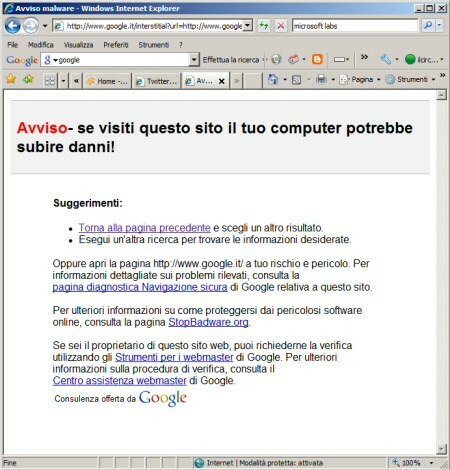 Il problema è diventato un caso internazionale al punto da portare il blog ufficiale di google a pubblicare un pezzo chiarificatore dove specifica che si è trattato di un errore umano. What happened? Very simply, human error. Google flags search results with the message “This site may harm your computer” if the site is known to install malicious software in the background or otherwise surreptitiously. We do this to protect our users against visiting sites that could harm their computers. We maintain a list of such sites through both manual and automated methods. We work with a non-profit called StopBadware.org to come up with criteria for maintaining this list, and to provide simple processes for webmasters to remove their site from the list. We periodically update that list and released one such update to the site this morning. Unfortunately (and here’s the human error), the URL of ‘/’ was mistakenly checked in as a value to the file and ‘/’ expands to all URLs. Fortunately, our on-call site reliability team found the problem quickly and reverted the file. Since we push these updates in a staggered and rolling fashion, the errors began appearing between 6:27 a.m. and 6:40 a.m. and began disappearing between 7:10 and 7:25 a.m., so the duration of the problem for any particular user was approximately 40 minutes. CAPTCHA: è giunta la sua fine?